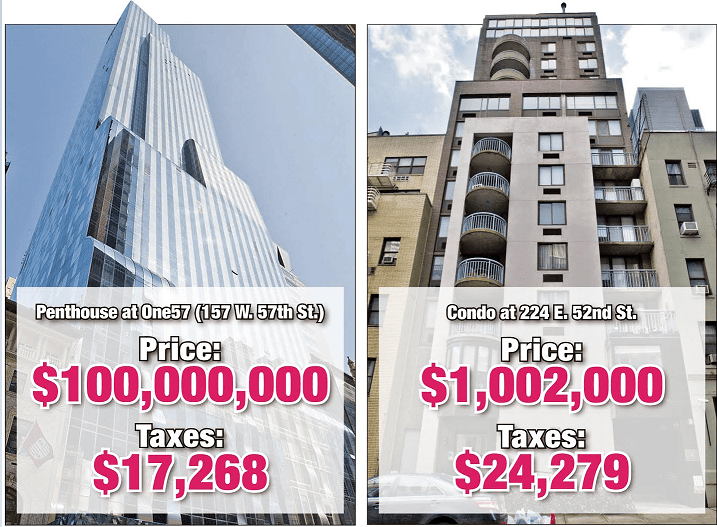 Last month, I provided the data for a New York Post article, How NYC Does Not Tax the Super Rich, which describes how NYC’s most expensive apartment, a penthouse that recently sold for $100M, has an annual property tax bill of only $17k. That’s an effective tax rate of just 0.017% (vs a national average rate of 1.29%). 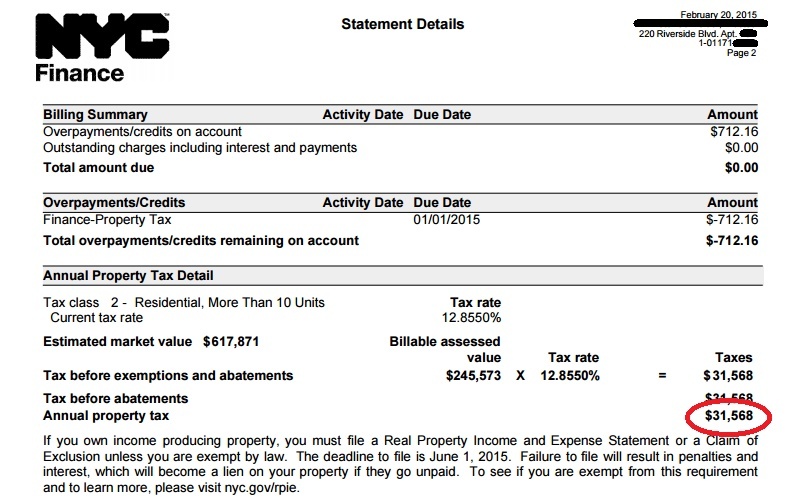 That case is pretty egregious, but it only scratches the surface of the mess that is the New York City property tax system. Generally speaking, the most important variable in a property tax calculation is the value of the property. New York City has a total of roughly three million homes, all of which are unique, so coming up with a fair system to value them all is a challenge. In short, New York City values condos and coops based on the income of rental properties with similar characteristics (here you can see the actual rental comps used: condo / coop comparables). There is a long history behind how New York arrived at this unintuitive valuation method, but suffice it to say it is mandated by an outdated state law that went into effect in 1981, before the proliferation of high-end condominiums, when condo/coop buildings were more comparable to rental buildings. Nowadays, when it comes to New York City’s ultra-luxury condominiums, there simply are no rental buildings that can even compare. As a result, the City’s valuation method ends up grossly undervaluing them. 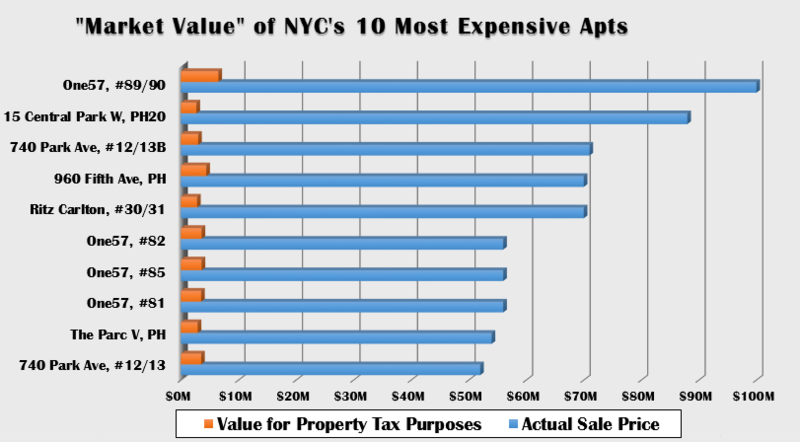 Here is how NYC [under]values the 10 most expensive apartments ever sold. As a result, they end up paying far less in property taxes than they probably should. If these 10 properties were taxed at the national average rate of 1.29%, they would owe the City a total of $8.7M in property taxes annually. In reality, their combined tax bill amounts to less than $1M. The examples above are extreme cases, but the trend is the same across all price ranges. 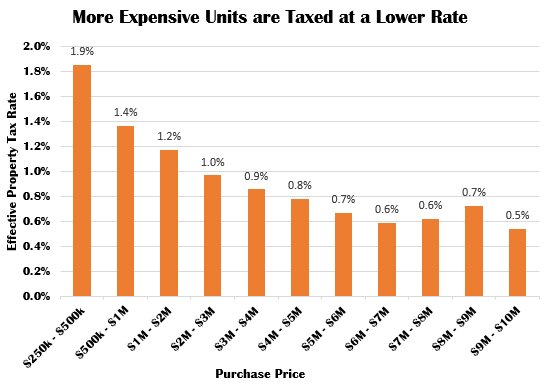 On average, more expensive apartments have lower property tax rates. For the chart below, I looked at all condo sales from the past two years, grouped them together by price, and calculated the average property tax rate paid by each group. 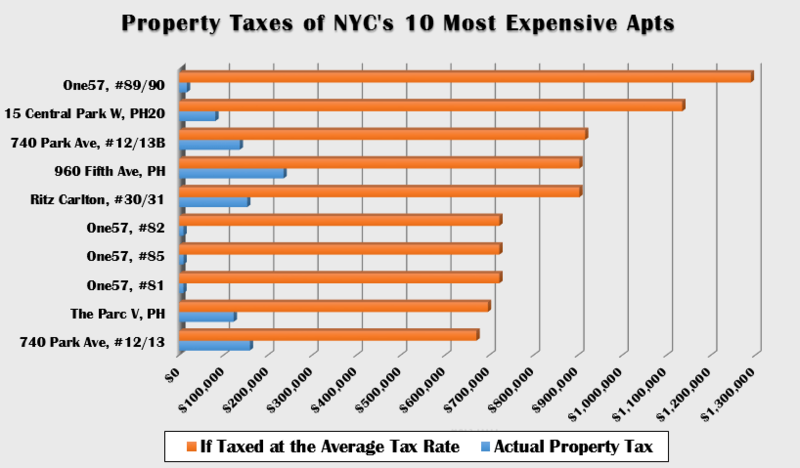 The chart above shows that more expensive apartments have lower property tax rates, on average. But by how much can property taxes vary among apartments of the same price? From a more practical point of view, let’s say you are in the market to spend about $1M on a new condo. As you are considering your options, is it safe to assume they all have more-or-less the same property tax treatment? 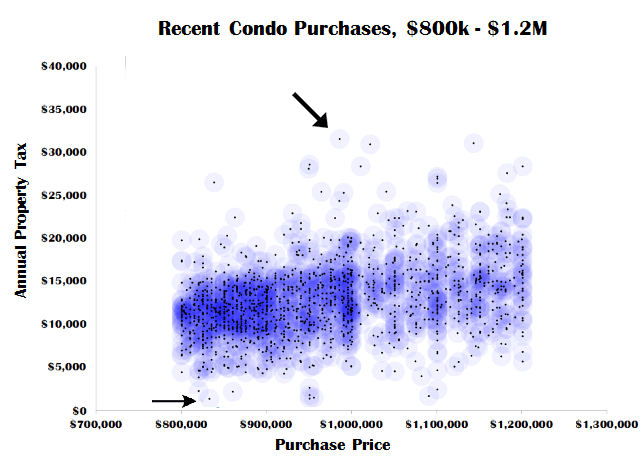 The chart below includes all condos sold within the last two years within the price range $800k to $1.2M. For about half of these apartments, property taxes fall within the range of $10k to $15k. But outside of that range, the variance is quite large: as low as $977 and as high as $31,568. Whoever bought this place got a sweet deal! Whoever bought this one got a nasty surprise at tax time. Next Article Where Do New Yorkers Come From? Yes, someone can find it if they want. But the person living there might find it embarrassing, and since the exact apartment is not relevant for what I’m trying to show, I didn’t see any reason to include it. p.s. the effort continues; I’m working on some visualization for this, but also introducing more features related to the residents, not just the owners. Sounds interesting. Would love to see it when it’s ready. And if there is any way I can be helpful, please don’t hesitate to drop me a note. 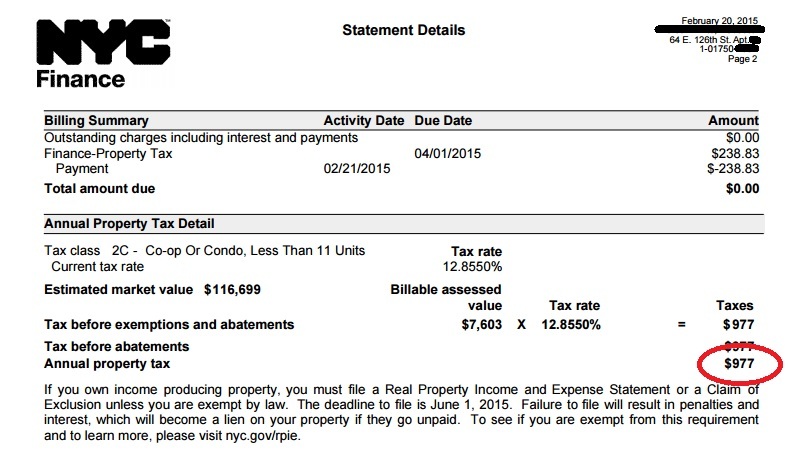 Have you looked at the R E Taxes paid by Mayor DiBlasio’s family – they own two properties in Park Slope Brooklyn, compared to like value buildings in Harlem or Chelsea? No, have not looked at those. But I have looked at the taxes on Donald Trump’s penthouse — very low. Does the NYC city government have control over this or is it one of those things that they need State permission to change?